Tandem Trades is a metal roofing specialist in Sydney. With metal roofing, you can have attractive roof designs - metal roofing can be laid to fit any shape roof, and is available in a wide range of modern colours to fit in with your home design. Many home designers prefer metal roofing - you can change the look of your home in the simplest way possible - by changing the look of your roof. Metal roofing has design flexibility and is compatible with both traditional and modern styles. Metal roofing is strong and secure, and helps protect homes from extreme weather events. Metal roofing is resistant to cracking, shrinking and eroding, and metal roofs are a low maintenance roofing solution. Would you like to find out more about a new metal roof and metal roof replacement? 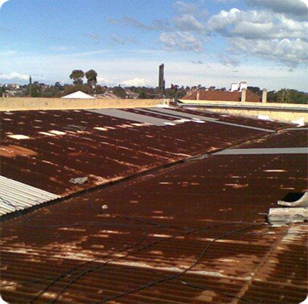 Call Mick - Quality metal roofing specialist on 0439 417 147 or send us an online enquiry. Metal roofing looks great! You can achieve highly attractive results, both in the shape of the roof and the colour. It's very common for architects to specify a metal roof for a new house, because it simply looks more modern - metal roofing adds a fresh, timeless yet contemporary character to a home, and becomes an additional, highly attractive feature. Heat Reduction - Because of its light colour and reflectance, metal helps to reduce heat build-up in attics and roof cavities. Metal roofing is also generally made from recycled content, and will be recycled after its life. Easy to Clean - metal roofs are designed to be low maintenance and easier to clean. Metal Roofing can be curved - unlike other roofing, metal can be curved to fit the style of the house. It can be shaped to deflect wind, or shaped to create style. It can be curved for verandas and awnings. Country charm - Metal roofs are typical in the country. If you are building a home with verandas and a country atmosphere, then a metal roof is exactly what you need. Whether it's a new metal roof, a roof repair, or a metal re-roofing, Tandem Trades can assist. We - Residential, commercial & industrial metal roofing contractors, have 25 years' experience installing virtually every type and style of metal roof, from modest residential properties to large commercial buildings. Call Mick on 0439 417 147 or send us an online enquiry. Metal roofing has become very popular, because it adds attractiveness, and can be faster to install. It needs less maintenance, and stays cleaner. It reflects more heat, and provides colours that will fit the theme of your home. Metal roofing adds tremendous beauty to residential buildings. Whether it's a functional A-frame application or a complex architectural design, Tandem Trades can do the job entirely. With a metal roof, you can select from more than 20 colours - you can also choose different profiles, from classic corrugated roofing to modern profiles. As a business, we know that we can only grow strong on your recommendation. We want you to be completely satisfied, so you can tell your friends, and recommend us. And we know what your satisfaction requires - a reasonable quote, and a professional approach; we measure the amount of roofing you'll need, with no excess or waste; and we do roofing instalation quickly - we don't drag it out and interfere with your lifestyle. Tandem Trades has 25 years' of experience in metal roofing. We have re-roofed thousands of roofs, and have thousands of very satisfied customers. We are a licensed metal roofing company and fully insured for all liability relating to our work, OHS statutory regulations ensuring the safety of the client/public and Tandem Trades employees. Whether it's a new roof, a repair, or a re-roof, Tandem Trades can assist. We offer metal roofing installation, roof replacement, metal roof repairs and re-roofing services throughout the greater Sydney area including Sutherland Shire, St George, Inner West and the Eastern Suburbs Sydney for all residential, commercial and industrial customers.